Direct Response Copywriting: Will Twitter Still Be Around In The Next Decade? Instead of making a comment on this blog, I decided to write down my own two cents about it. I never did get twitter (and linkedin as well). I am sure millions of people signed up for them and actively use them. It's a great tool for connecting to people. But as Jack Asman mentions in his blog, it's not half as good as its big brother, Facebook. With twitter, there's not enough visual stimulation going for it. When I want to share something that had to get attention, my only option is the 140 characters (plus the link). It's probably great for mobile apps, where brevity is everyone's cup of tea. If I were scanning for something that will interest me, text plus link is not enough. The more eye candy, the better, to get people's attention. If a particular person does not know the person sharing the content that well, the content might not be noticed at all. With facebook, when you share a link, you get a thumbnail from the website, plus a short description about what you will find from that site. They are great for catching people's attention. Your content has a better chance of being seen on facebook than with twitter. As a marketing professional, some people might say that it's better to broadcast to all the popular sites--just to have all the bases covered. Well and good for them. For me, instead of spending time with twitter (or linkedin) I'd rather spend that time engaging on facebook. 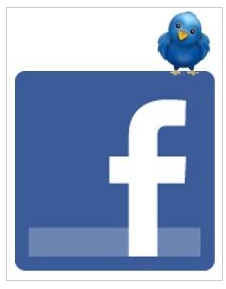 I might miss a few things by not using twitter, but I am sure I gain a lot more by spending more time with Facebook.